Use any pasta you have in your pantry, but my favorite is rigatoni, it is chunkier and bit thicker to soak up pesto sauce. I love this served with broccoli corn bread. Toast pine nuts in skillet until lightly browned; remove from skillet and set aside. Saute garlic in hot oil. Add pesto sauce ingredients except parmesan cheese. Cook till thickened and bubbly. Reduce heat and stir in grated parmesan cheese. Add salt and pepper to taste. 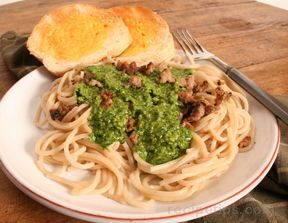 Toss cooked pasta and canned tuna or crab meat with hot pesto sauce. 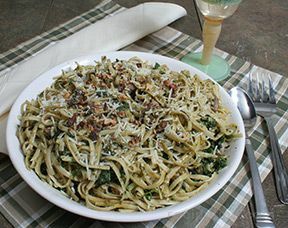 Transfer to serving dish and top with pine nuts and grated parmesan cheese. 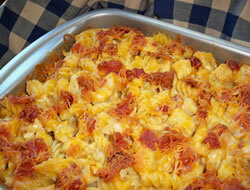 You can substitute canned tuna or crab with chunks of fried chicken, vienna sausage or cooked Italian sausages.